I've probably said this before, but I'll say it again, just in case you're new here. I'm afraid of pies. Not eating them but making them. 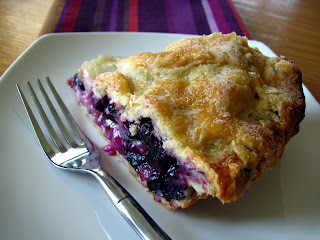 I haven't had a lot of good experiences making pies so when I saw that Amy of South in your mouth had chosen Dorie's Double Crusted Blueberry Pie for this week's Tuesdays with Dorie recipe, I was afraid. But, when I told Martin of this week's choice he looked at me with a "you better make this pie" sorta look and well, I couldn't refuse the man his pie, it is one of his favorite desserts. The part that I usually have the most trouble with is the dough. It's almost always too dry, never comes together for me, crumbles when I try to roll it out, every single problem you can have with pie dough, I usually have it. I made the dough by hand with a pastry cutter and my own two hands, no food processor here. So you can imagine my surprise when the dough did come together quite easily, no extra water required. I guess all that butter is in there for something! It rolled out pretty well too, although it was a little crumbly I managed to get it into the pie plate. The filling had me a bit perplexed, I actually read the recipe a few times before I could wrap my mind around the idea of flour in there. But, as I had decided not to tweak this time, since I'm so bad at pie making, I followed the recipe to the letter. I thought it looked a bit dry but I told myself the berries were fresh and hadn't given out their juices yet and I didn't want a runny filling, so I put the pie together sprinkled it liberally with sugar and into the oven it went. After the alloted cooking time, the crust was beautiful but it was so buttery that there was butter dripping out of the pie plate! The filling wasn't bubbling much, it wasn't overflowing at all and my pies always overflow! I took it out of the oven anyways and waited, and waited while the pie took its sweet time cooling down. It was pure torture! After a few hours, and many a photo later, we finally cut this baby open. It is quite delicious, but... Yes there is always a but when I make a pie. Although the filling was very, very good, with the hint of lemon and the gorgeous blueberries, I think the flour in the filling was too much. Or maybe it works best with frozen fruit, but my filling didn't look the way it should. There were patches of whitish juices and it was a bit too thick. As for the crust it came out so beautiful and golden but (there it is again) it was a bit too buttery for me. Martin didn't complain though, he just loved it. Maybe I'm just not a pie girl, or perhaps I haven't found the perfect pie yet. All I know is I enjoyed making, and eating this one so I'm really glad I made it. 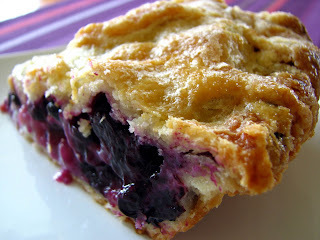 If you're big on pie or just curious to see what the other Tuesdays with Dorie members thought of this blueberry beauty, check out the blogroll! If you're interested in the recipe you can find it in Baking from my Home to Yours by Dorie Greenspan or on Amy's blog, South in Your Mouth. I'm glad that the pie crust behaved for you finally - they really are finicky, aren't they? And now you have a base recipe you can tweak to what works for you! I think a lot of us had the whitish chunks in the filling issue (I know I did). Your slices look incredible! I say fear pie no more!!! Your pie looks lovely even if you weren't entirely happy with it! I think it looks picture perfect. My filling was quite dry as well. I even added the juice of a whole lemon instead of just a squirt. However there were lots of juices when it was done and it never did thicken up like I would have liked, although to be fair I did forget the bread crumbs! Your crust looks great...good job! Sorry that the pie wasn't perfection for you-but it sure looks really delicious. Your crust looks wonderful-so mission accomplished. Congrats on your many awards below. Well dang, lady, if nothing else you've mastered the art of making a pretty pie! Your slices look tasty and delicious. Now you are an pie expert, I didn't need any water too. It looks bakery perfect! Great job! 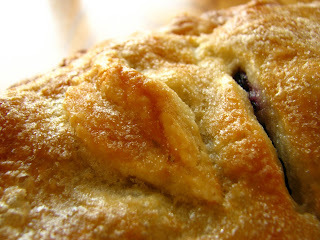 Looks sparkly and beautiful- I think pie crusts by hand are fun and work out well most of the time, I'm glad yours did! Your pie turned out great. If you ever decide to try it again with blueberries, here's a suggestion: for the filling, mix the flour, sugar, salt, and zest together first. Whisk them really well until fully mixed. Then add the blueberries and a squeeze or two of the lemon juice, and fold them all together. This should help with the 'flour' problem. I think your crust looks great! I also have a history of problems with crusts but found this one better than others I've tried. Your pie looks delish! 'Buts' aside, it looks just lovely! I definitely think the dough would be easier with a food processor. Doing it by hand was kind of hard. Getting a finer blend probably would have helped with your melting butter problem, but without a processor it's hard. Also, you could try shifting the balance a little more towards vegetable shortening - that should tone down the butter flavor. Glad you got the crust to work for you. It looks like a really pretty piece of pie! I'm scared of pie, too, so I had my son make it! Your photos are absolutely gorgeous. I'm going crazy over that crust. It looks so good. That is one pretty slice of pie! I too am pie crust challenged, but this one finally worked for me. Your pie looks lovely and the crust is perfect! Well, I think your looks just fabulous! I love that the filling was so thick. I hate when the pie filling falls out. I had the same problem with the white stuff, but your pie looks delicious! Great job with dough. It really does look beautiful and flaky. I think you should add "pie baker" to your list of credentials...and it sounds like Martin would like that, too! Congrats on overcoming your pie fear! I have to admit that I thought my pie filling was a bit dry, but then I didn't use quite enough blueberries. I will play around with the filling next time, maybe cut it by a third. Whatever the case I was so happy to have successfully made a fruit pie, I didn't care! It looks like you have nothing to be afraid of! This pie looks gorgeous! That looks so good! I am really looking forward to the blueberries. It looks fantastic - no fear needed! Congrats! I'm glad that your pie crust turned out so well. I agree about the hint of lemon, which added such a nice freshness. I also thought that the amount of flour added was way too much. The crust on the other hand is amazing! You did a wonderful job on the pie Lynn! It looks gorgeous! You have nothing to be afraid of anymore! That is a stellar looking pie. My filling had some flour streaks as well, but I liked how well the filling set that I didn't really mind. Next time you make a crust cut the amount of butter back and add lard (my favorite for ultimate flakiness) or shortening in its place. You might find that to be a more pleasing crust. It's beautiful!! I think you did a great job. Pies scare me, too. In fact, I have my first from scratch pie in the oven right now. It's not pretty, but it smells good, hehe. Hurrah! Dough success!! Victory! Your pie looks scrumptious! Yeah for successes this week! Your pie is gorgeous. Nothing to be afraid of! I do agree w. you that the flour made the filling a little wierd...I'm going to stick with my good ole standby of ground quick-cooking tapioca the next time. I can totally relate to your fear of pies... and have had the dry, crumbly pie dough experience too. I'd never know to look at your pictures that you weren't an expert, though. It looks beautiful and perfect!! I never would have guessed that you're afraid of pies. Yours looks wonderful. I had the same problems with the flour. Mine all ended up on top of the pie and since I did a lattice you could see it! Yuck. That pie looks fabulous! The crust is perfect and the filling looks divine! I would say that you definitely hit the mark on this one! Impressive! Are you kidding?! That pie looks unREAL!?! That's the winner, in my book! WOW! Your crust looks wonderful, good job! oh my! That pie looks amazing! glad the crust turned out nicely! I have been having problems with pies too and I have to say this one was awesome! Great job! It looks FABULOUS! Lookit that amazing crust..! Great job. I need to try this again I think. I've heard about that whitish goo on other blogs, too. This is my first week as a TWD-er and what I've found so interesting is how one recipe can turn out so many different ways. Hopefully next week's chocolate pudding will fare better for you. Pie crust strikes fear for many. I think I a lot of people never try their own. 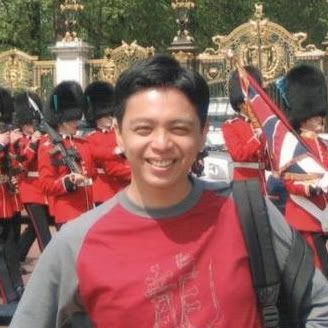 Kudos to you for trying again and succeeding. It looks perfect! oh my god! i would so eat this. all. in one go. delicious. you should give yourself more credit, my dear friend - this is crust elevated to perfection! Yours looks absolutely perfect though! That pie looks stunning, I wish I was there to sample it! I am completely jealous of your pie crust. It looks so flaky and buttery. Simply a perfect pie! 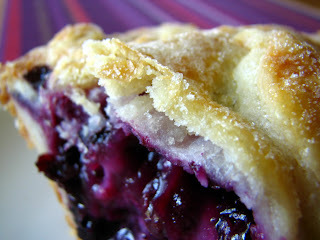 And my husband was just reminding me how blueberry pie is his favorites summertime dessert. Looks beautiful! Now there's a pie crust that actually looks nice when it's served (mine always fall apart before I even get the pie slices plated!). Wonderful job, it looks delicious...the crust is PERFECT, no doubt!